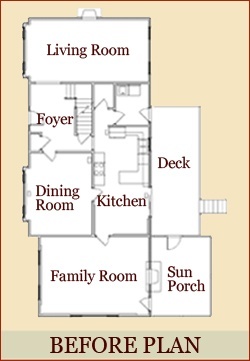 Visualizing the possibilities in a home in which you've lived for many years can be difficult. 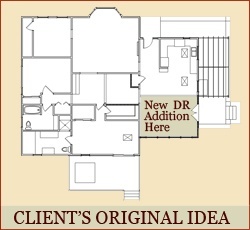 Don't hesitate to bring in a design team skilled at thinking outside the box" for your home remodel. This may result in some interesting solutions that you may not have considered. But their vision, ineffective, undesirable or unappealing areas of your home can be transformed into practical and loveable living spaces, while ensuring a good return on your investment. Here are some Case Studies. Getting more doesn't always require "going out". 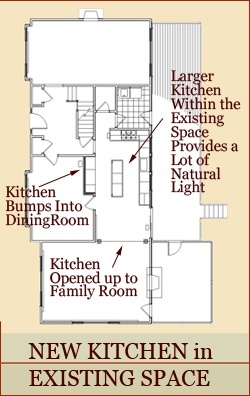 A Wilton based family wanted to update their 1980's spec home kitchen and create a space large enough to accommodate an island for family and friends to gather around. 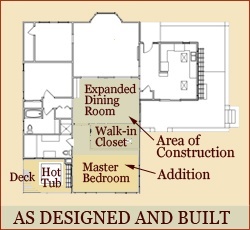 They came to us requesting we add on at the rear of the house which would have meant the expense of constructing an addition as well as the added costs oreworking of the large deck that ran the length of the house. In discussing their frustrations with the space it also came to light that they wished it could be open to the adjoining family room like newer homes. By asking the right questions we learned that they had never used the formal dining room but, being concerned about resale, did not want to eliminate it completely. With objectives defined, parameters set and a budget in place we set to work creating proposals that offered them solutions that did not necessitate an expansion of the home and worked by reallocating existing interior space. Stealing room from the formal dining room to house the refrigerator, double ovens and a pantry enabled us to widen the kitchen enough to add the island they requested. 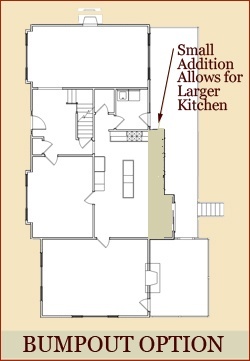 By opening up the dining area with sliders to the deck and tripling the windows on the back of the house, the kitchen appears to have grown exponentially without adding a single square foot. The wall between the kitchen and family room was removed. The decorative columns and arched soffit define the new opening, and creatively hide the necessary posts and beam. While we did draw up a small bumpout addition as alternative, listening to their needs and carefully evaluating options within their existing space allowed a clever, but simple and cost effective solution to emerge that made more sense to all of us. By opting to take away a little space from the diningroom and open up the kitchen to their great room area, we were able to meet their high level objectives: a larger up-to-date kitchen, room for a wide refrigerator, lots of natural light, an island, and "opening up to the kitchen to the great room". Not doing an addition allowed them to significantly upgrade their cabinetry choices and spend less than they had originally anticipated. They were delighted. 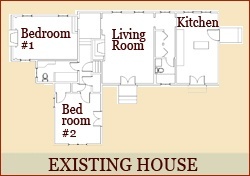 In this case, thinking "outside the box" meant thinking "inside the box"…staying within the four walls. Sometimes you may have lived somewhere so long that you only see it one way. A fresh pair of eyes can bring many "I hadn't thought of that" possibilities. A Weston couple came to us requesting more light and an improvement to their awkward L-shaped dining room, as well as a small bedroom addition to give them more closet space in the master bedroom. Their original thought was to place an addition behind the kitchen to square off the dining room and take space from the existing dining room to create an additional walk in closet. " The addition would push the bedroom closer to the surrounding woods, thereby creating the feel of sleeping in a tree-house. The net result is a an enlarged rectangular dining room that now has direct access to the aforementioned patios via a repurposed sliding glass door, a large walk in closet lit by the skylight that used to be above the bed, and a new maintenance free deck right off the bedroom for their cherished hot tub. While the solution seemed simple to our designers, it took that fresh set of eyes to show the clients what they had never thought of in all the years in the house. When the proposals were presented they said, "It never dawned on us." "What sets a talented Designer apart is their ability to listen to what the client says they want, make an assessment of the short comings of the space, and come up with some solutions that accomplish not just what the customer is concerned with, but also solves two or three other issues all within the initially derived budget. This project was an excellent real-life example of such a design solution." Gary Clark, President. In this case, "Thinking Outside the Box" meant thinking through an entirely different way of laying out the house and the proposed addition. Helping you see the possibilities and letting go of ideas you had that may not work well. The owner of an old hunting cabin in Wilton asked us out to her home to discuss replacing a bathroom. In our discussions it soon became clear that this was a band-aid attempt to appease her from getting the house she really wanted for her family. 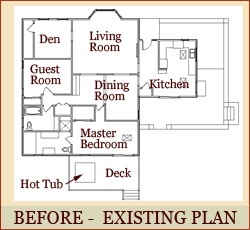 In the end, she ended up doubling the size of her home, adding a second story and a kitchen addition. She re-did everything in the house but the living room and the bathroom which brought her to us in the first place. How did that happen? 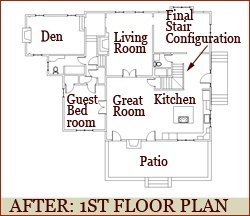 The client had ruled out a grand plan for this small one story home, because she couldn't figure out how the stairs to a second floor would work. We talked her "out of her box" – presenting layouts that worked with various stair configurations She was thrilled with the final project and the iterative design process by which we arrived at some sensible solutions to her family's expanding needs. Before meeting us, she couldn't find someone who would work with her in a participative cooperative fashion. She felt that everyone she had talked to was strongly opinionated and would not dignify her ideas by attempting to think through them or illustrate them. She felt that, because they were being paid to come up with ideas, they felt that their ideas were right and hers were "wrong". She found their dismissive approach to her ideas offensive. We presented her with several viable architecturally pleasing solutions, any of which would be satisfactory for her home. We also worked through "her" ideas so she could see why they didn't work. This ultimately allowed her to let go of her ideas in favor of one of our alternatives that accomplished her original goals in an achievable manner. We believe that offering multiple design proposals, along with the pros and cons of each, enables our clients to make fully informed decisions that result in the best design for them. Often times, other firms only provide their "best" solution thereby denying the client the option of seeing various alternatives and having the chance to decide for themselves which is best for them. Such an approach excludes the client's involvement in creating the home of their dreams, which seems objectionable. In this case, "Thinking Outside the Box" meant seeing things from the client's point of view, and working through their ideas so that she could let go of them and embrace a more architecturally appropriate solution.